My classmates and I ferried over to North Haven, Maine, an island with a population of under 400 residents. Eric Hopkins lives and paints on this sanctuary that is accessed three times daily from the mainland. An old black Jeep was waiting, keys on the dash, to roll along rocky gravel roads to Eric’s home. Eric has three buildings on a beautiful piece of land by the water. The calm breaking of waves can be heard from his yard. Red, blue and yellow lobster traps dot the bay. Eric’s sleeping cabin has no electricity because he prefers to avoid distractions that may impact his sleep. His studio is open and colorful. Finally, his home, not much larger than his studio has a wood fireplace at its center and a second creative space upstairs. Eric, dressed in jeans and a flannel, flattened tall grass to show me all corners of his property. I was prepared with tall socks and tick spray while he opted to go barefoot. He received a call on his flip phone and mounted his picnic table to achieve better reception, We shared a mutual love for tea, agreeing that coffee just makes you too jittery and unable to focus. Leaving his house I felt full of whimsy. Eric has established his life in a way that feels right to him. He made a voyage to the mainland with us and somehow managed to acquire a grocery truck. Local artist and produce delivery man. He is living his best life, and it's contagious. 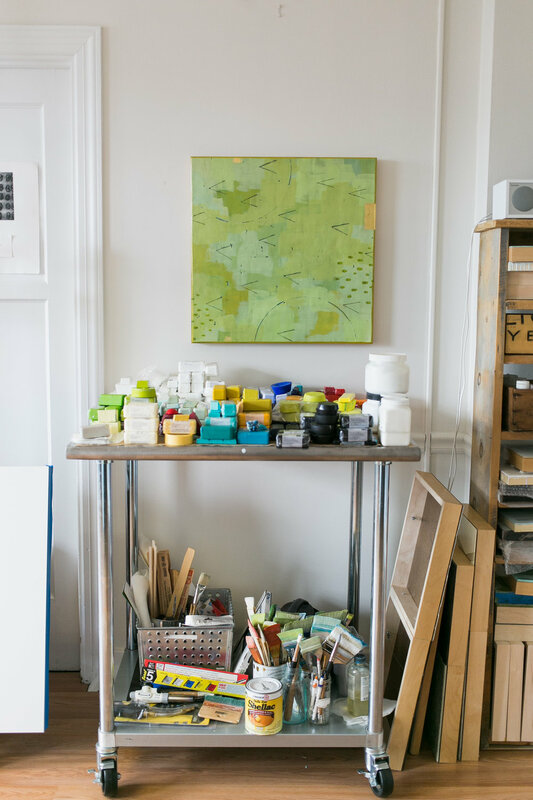 Above bustling Congress Street in Portland, Maine sits Dietlind’s bright and airy studio. 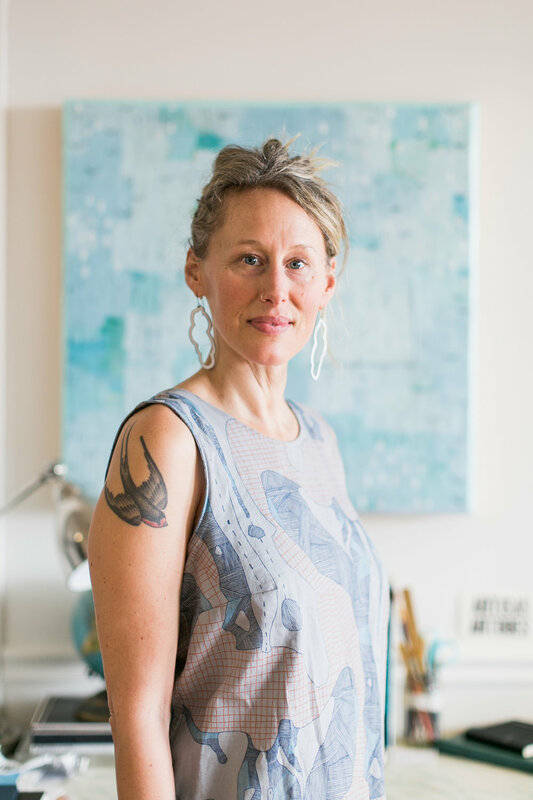 Dietlind is an painter who works with encaustic. She fuses several layers of thin wax together and incorporates different colors and textures to produce beautiful art. 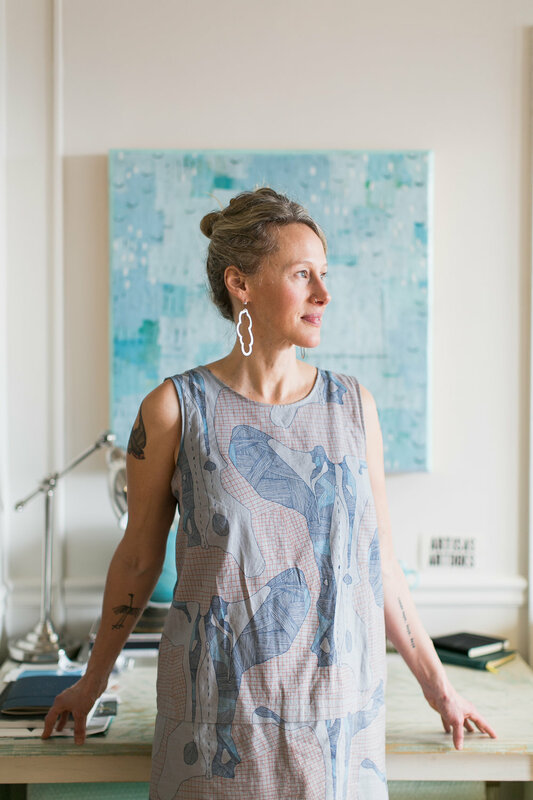 Dietlind, wearing jewelry and a dress made by friends, explains: “I find the slow, repetitive aspect of applying and fusing encaustic deeply meditative and calming”. The studio is serene, open and shoe-free. The small detail afforded a feeling of home. I had the pleasure of spending some time with her observing her painting and asking her questions about how she became an artist. Q: What experiences led you to where you are in your career now? A: I studied history and writing with no intentions of becoming an artist. While I was living in San Francisco, I fell in love with a painting by a local artist. I ended up studying with her and it wasn't long before I became serious about making as a regular practice in my life. 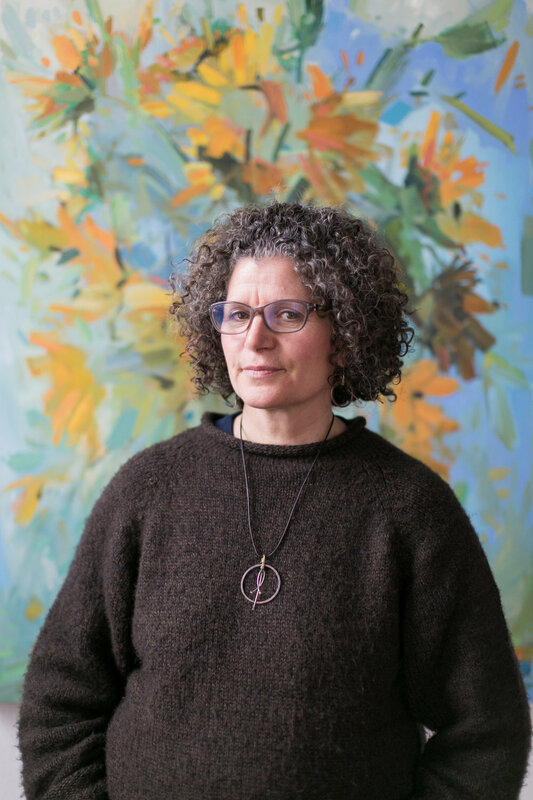 When I moved back to Maine in 2010, I met Kim Bernard and learned about encaustic. This medium immediately appealed to me because of the ability to build up and carve into a surface in a way that is quite different from acrylic or oil. Q: What are your thoughts on work/life balance and do you feel like you’ve achieved it? Q: Describe one thing that has been a game changer in your process. A: In 2012, I did a residency at the Stephen Pace House in Stonington, Maine. Spending hours by myself was so nourishing--I didn't realize how much I craved it. I did a lot of proprioceptive writing and painted from early in the morning until late in the evening. My experience of time shifted and I came away from my residency with a different understanding around how I wanted to work in the studio. I understood that I needed a longer period of time in order to sink deep and that was the place from which I wanted to create. I had to reorder a few things in my life in order to accommodate that, but so far it's worked. Q: How do you recharge? In other words, when you are feeling drained creatively how do you recharge so that you can get to a place where you are productive and creative again? A: If I need to recharge, it generally happens outside the studio. Usually I head for the woods with my partner and my dog. I might also take a break from painting to spend more time tending to the other parts of my life--cooking, reading, practicing yoga. It is really important to learn how to ride the waves as an artist. Sometimes I will go through a long period in which everything is flowing and and other times a painting might just keep derailing. I've learned to live with the small voice that questions why I spend so much time and money making art. Ultimately, I try to take all of it less personally--the good stuff and the hard times. I just show up and paint. I will photograph makers in their work setting and ask them questions about what led them to their current profession. Individuals are abandoning 401Ks, pensions, PTO and security to work hard and long on projects of personal significance. Comfort is thrown to the wind for joy and fulfillment. Simple security is not enough anymore. This project will explore the origins, emotions and circumstances of a more actualized life. A life that has adults waking up excited for the day. A collection of stories associated with my recent work.